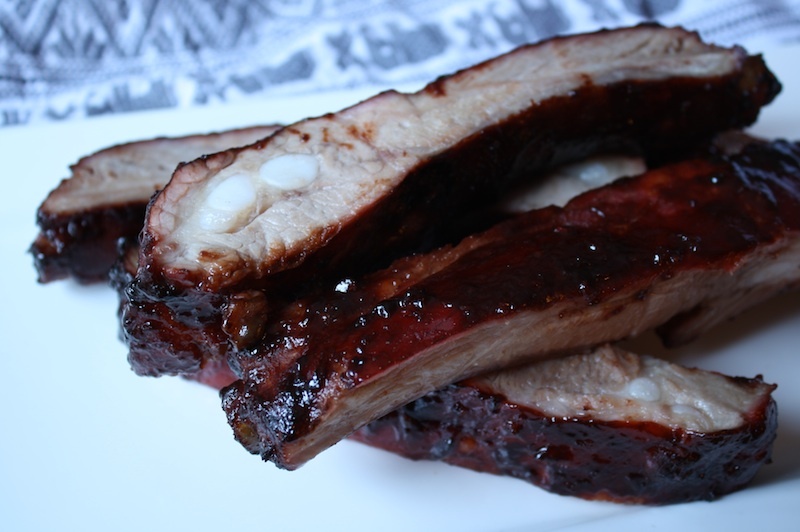 I loved those ribs with their sweet sticky glaze, nibbling off every little bit of meat and licking my messy fingers. I still love those ribs so with the Chinese New Year upon us, I thought I’d make some. It’s been far too long and they are just as delicious as my 5-year-old self remembers. The key here is to track down some hoisin sauce, which is easily found in any Asian market and more commonly in a regular grocery store. It’s a kind of Chinese BBQ sauce and no Chinese BBQ Pork or Peking Duck would be complete without it. I use it frequently to add just a touch of sweetness to my stir-fries and it makes a great dipping sauce, thinned with a little soy and rice vinegar, for pot stickers. Have it on hand and you’ll use it more than you realize. The red food coloring is optional but I have to say, it really gives the ribs that authentic 1970’s American Chinese restaurant look. That red tinge that threatens to stain my fingers brings me right back to those days and I love it. Oh, just do it. It’s just not the same without it. There are two ways to cook these ribs: you can cut the rack into individual ribs for marinating or you keep the slab whole. Cut them into individual ribs and there’s a more intense coating and caramelization of the sauce in the oven. I prefer to marinate and cook the whole slab and cut them after cooking, simply because it’s easier but it’s up to you. This Friday is the start of the Chinese New Year and it’s the Year of the Horse. If you were born in 1918, 1930, 1942, 1954, 1966, 1978, 1990 or 2002, this is your sign and they say your most striking characteristic is strong self-confidence. So kudos to you! But for all of us, this is the year where we all go forward confidently in the direction of our goals and dreams, just as the horse gallops at top speed toward its destination. So grab some ribs, jump on that horse and GO! STRESS THERAPY BAKING FACTOR: BETTER THAN THE TAKEOUT JOINT. I’m going to say it. The BBQ ribs are never that good at your neighborhood Chinese joint. Tough, dry, gristly; so often a disappointment. Skip the BS and just make them yourself. If you can get your hands on some good pork … stand back! 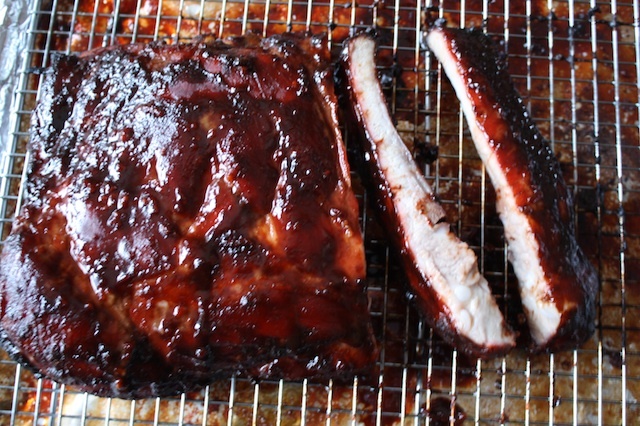 Marinate them early on and you can have juicy, delicious sticky ribs in about 1 ½ easy hours. And they reheat beautifully so making ahead is definitely an option. These would be excellent for that big game that’s coming up this weekend or the really big “Games” that start next week. Whisk together hoisin, soy, sherry, garlic, sugar, food coloring (if using), and five spice in a large bowl. Add ribs; toss to coat with marinade. Set aside, covered, to let marinate at room temperature for 1 hour. Preheat oven to 350°F, place a rack in the lower third of the oven and arrange a baking rack on top of a rimmed, foil-lined sheet pan. Remove ribs from marinade (reserve marinade); arrange on the rack, meat (not bone) side up. Place pan in oven; pour in enough water that it reaches halfway up the sides of the pan, making sure the water does not touch the ribs. Bake ribs for 35 minutes. Baste ribs with reserved marinade; flip and baste again. Increase heat to 450°F. Flip ribs again; baste with remaining marinade. 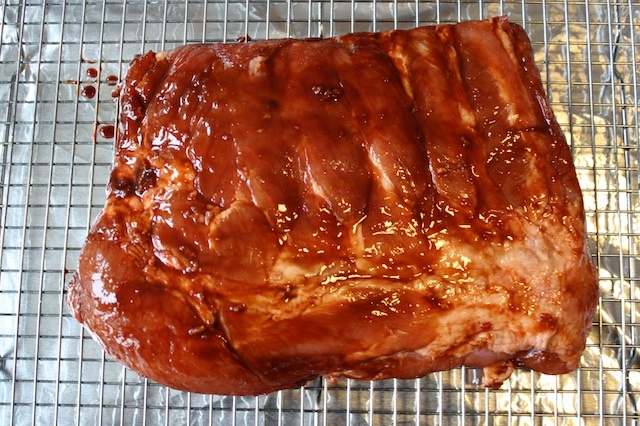 Continue baking until ribs are glazed, browned, and tender, about 15-20 minutes more. Let cool slightly and cut into individual ribs. I like these as is but some like them with Chinese mustard or duck sauce. Can be made up to 2 days ahead; reheat slowly in a 350°F oven. A definite Superbowl item! I remember that PuPu Platter well.